A SpaceX Falcon 9 rocket and Dragon spacecraft stand atop a pad at Cape Canaveral Air Force Station in Florida after an aborted launch attempt on Jan. 6, 2015 due to a technical issue on the rocket's second stage. The private spaceflight company SpaceX aborted the planned launch of a Dragon cargo ship bound for the International Space Station early Tuesday (Jan. 6) due to a technical glitch with the spacecraft's rocket. 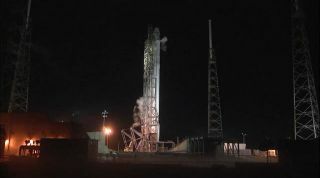 SpaceX called off the Dragon launch less than two minutes before its planned liftoff at 6:20 a.m. ET (1120 GMT) from the Cape Canaveral Air Force Station in Florida. NASA spokesman George Diller said an actuator issue on the second stage of the SpaceX-built Falcon 9 rocket launching the mission prompted the abort. "That actuator drift issue will have to be resolved before Friday's launch attempt," Diller said. According to a NASA update, sensors on the Falcon 9 rocket reported "actuator drift" in the thrust vector control system on the second stage of the 157-foot-tall (48 meters) rocket. SpaceX's first Falcon 9 launch of 2015 actually a double mission of sorts. The flight is primarily aimed at launching a Dragon cargo ship to the International Space Station to deliver NASA supplies. The flight, called Commercial Resupply Services 5 (CRS-5), is the fifth of 12 planned Dragon delivery missions by SpaceX under a $1.6 billion contract with NASA. The Dragon cargo ship is packed with 5,108 lbs. (2,316 kilograms) of food, water, gear and science experiments for the six-person crew currently living on the space station. In addition to the delivery flight, the Hawthorne, California-based SpaceX also hopes to test an innovative reusable rocket landing technology as part of an internal program aimed at building reusable launch vehicles. For the test, SpaceX has outfitted the first stage of the Falcon 9 rocket with landing legs and stubby steering fins designed to fly the booster to a floating platform in the Atlantic Ocean. SpaceX founder and CEO Elon Musk and other company officials have repeatedly stressed that the odds of success for the ambitious test are low, with Musk citing the chances as about 50-50. If SpaceX is able to make a second launch attempt on Friday, NASA's live coverage will begin at 4 a.m. EST (0900 GMT), Diller said. You can watch the launch live on Space.com, courtesy of NASA TV and SpaceX.